Okay, folks, it's time to tantalise the tastebuds in a little cultural hotspot that's hot not only because of its spices, but because the food's fabulous, the culture exotic, and the experience exciting. The flavours of Africa have, much to our benefit, arrived in multicultural Footscray. A plethora of Ethiopian bakeries, grocery stores, cafes and restaurants are hitting the hungry spot in and around a precinct fast becoming known as Little Africa. It's centred around Barkly, Nicholson, Hopkins and Irving Streets. One of the most famous eating spots is Cafe Lalibela, the first Ethiopian restaurant to open in Melbourne in 1999. The food's authentic and inexpensive, and the place fills with Africans – many in bright, traditional dress – which is always a sign that the food's the real thing. While you can also get great Ethiopian food around the Fitzroy, Collingwood and Kensington areas, Footscray's a sort of central one-stop shop where you get to absorb various aspects of the culture in the one place. Check out the various Ethiopian enticements here. So, what exactly does Ethiopian food consist of? Well, ideally you go and check it out for yourself, but here's a little teaser. The cuisine is characterised by various types of injera (pictured). These tasty, flat rounds of spongy, slightly sour, lightly-bubbled bread are delicious. The bread is often cooked in spiced butter – which is an essential and much-loved part of the cuisine – and flavoured with berbere, a pungent, hand-ground, brick-red spice mix made up of serrano chilli and up to 25 other spices, also an essential ingredient. Then you top it with various curries and dig in by tearing off bits from the edge, wrapping it round a chunk of curry, and scoffing (using your right hand to observe the cultural etiquette). If you'd like to make your own, it's easy. Check out the recipe. It is also commonly topped with a richly-flavoured wat (pronounced 'wot'), a spicy meat stew (often served with a boiled egg), or it might accompany tibs, which is sautéed lamb or beef cooked up with a generous scattering of green peppers and onion. You can learn more about Ethiopian food here. Communal eating is an integral part of the culture, as is eating without implements. It's messy, fun and flavourful. I mean, why use cutlery when perfectly good fingers do a much better job and require a good licking afterwards? Why? 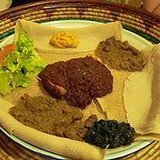 Find out what’s wat in Ethiopian cuisine. When: Antime the tummy rumbles. Cost: Depends on your appetite!